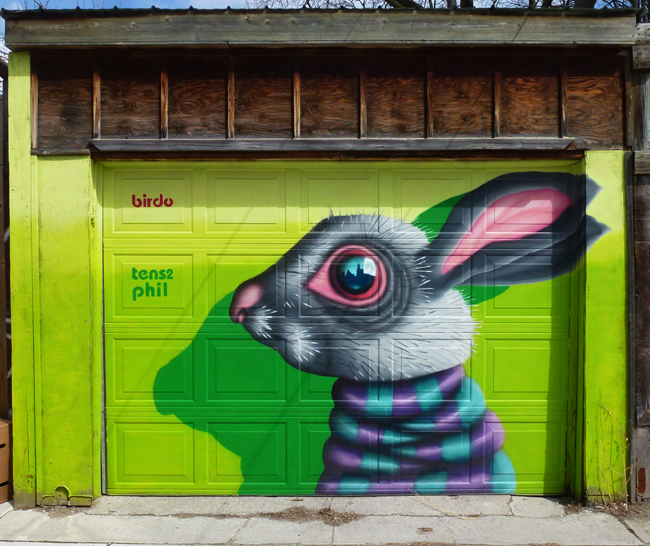 Birdo is one of my favourite mural artists in the city and I was pleased to discover this piece during a recent walk down a laneway near College St. I wish I had found this cutie before Easter as it would have been the perfect post! Tomorrow I'll show you what the houses look like that own the garages along here. Taking part in Monday Murals. Click HERE to see more murals from around the world. This is pretty darn good. It looks like it's being choked around the neck and I love the eye reflections - appears to be a city background. And that nose; what a sniffer! That's very eye-catching. Yes, would have been perfect at Easter. ...it's all about the timing! You found a great mural. I will look forward to seeing your post tomorrow. Have a great week. What a cute rabbit! It's another great laneway mural. A cute rabbit, I like the reflections in the eye. I like this mural very much. Marvelous! Fun to see this bunny! A very cute rabbit, it's very well done ! I get the impression that some of these painted garages are done defensively, i.e., painting them first before a tagger gets to them. This bunny is adorable! I want it! What a fabulous discovery Pat, too cute!